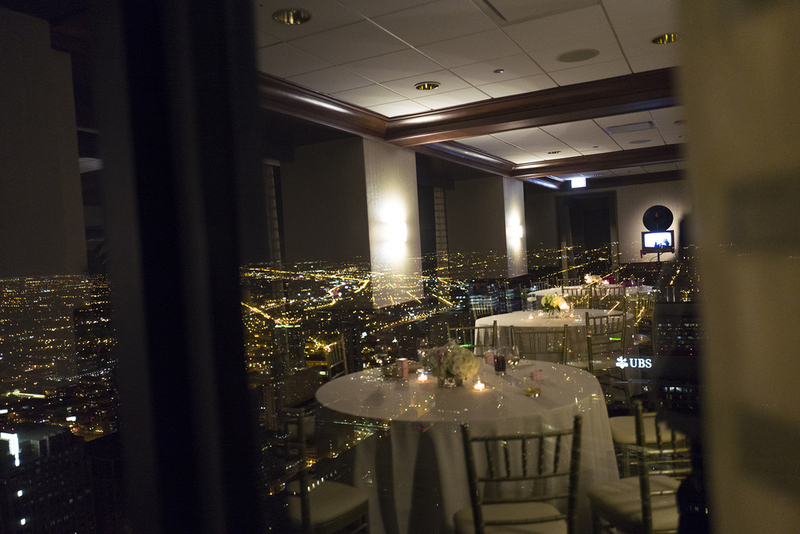 This was a beautiful Chicago wedding at the Metropolitan Club located on the 66th and 67th floor of the Willis Tower. The lighting was perfect and guests could enjoy the views of downtown Chicago throughout the evening. Later in the night guests were invited to visit the Skydeck Chicago's clear observation decks on the 103rd floor! Our vintage photo booth charm fit in perfectly in this chic yet classic downtown Chicago wedding venue. Fotio used a textured wall in the event space which looked really amazing in the photo booth pictures. We had the pleasure of working with Ashley Godinez the Private Event director at the Metropolitan Club and Kristin from Toast and Jam DJ's (one of our favorites!!). A Fotio photo booth setup in the Metropolitan Club at the Willis Tower. Beautiful set wedding tables at the Metropolitan Club Chicago. Beautiful views and beautiful flowers at the Metropolitan Club. A couple pose for a formal photo booth picture as the reception begins! The bride takes a Fotio solo shot! Looking good! DJ Kristin from Toast and Jam rocking! A silly photo booth pic with our vintage props taken at the Willis Tower.